I'm a Colette Patterns size 12, but I cut the waist panels in a size 14 so I could wear the shorts a tad lower on my waist. 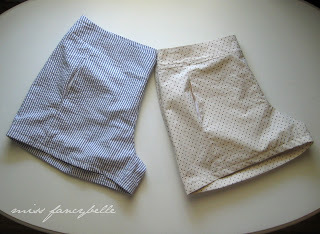 This is a very high-waisted shorts pattern and, in my opinion, that's not a very flattering look from behind. Making them more "low-rise" seemed to solve that dilemma somewhat. 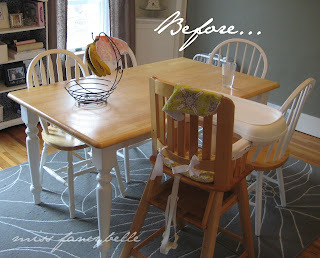 The blonde and white dining set went much better in our old house, but seemed to clash with the gray walls we inherited (and love!) in our current dining room. Plus, you can't tell from this pic how badly the previous finish on the tabletop had been worn off in the "high traffic" areas! 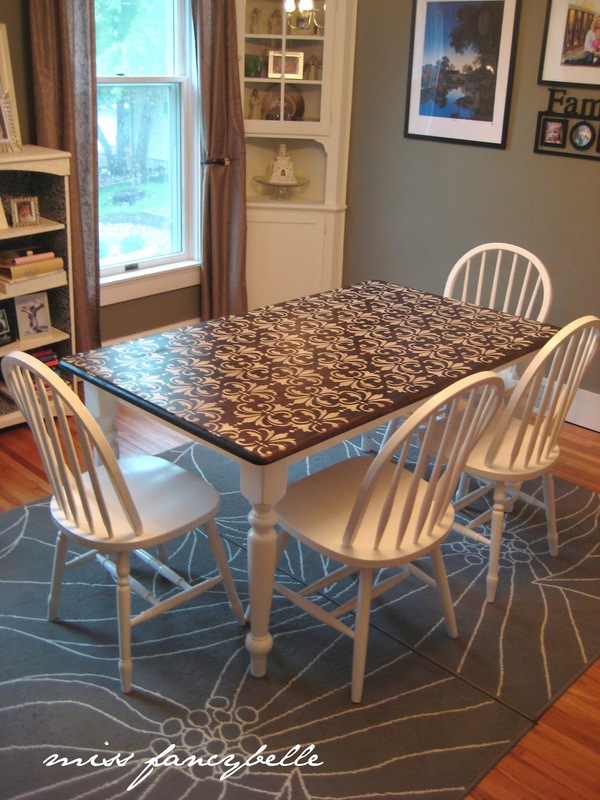 Initially, I had wanted to paint the whole thing white so I had plenty of paint on hand but I was nervous to leave such a blank canvas, so to speak, for my kids to put marker and paint stains all over. 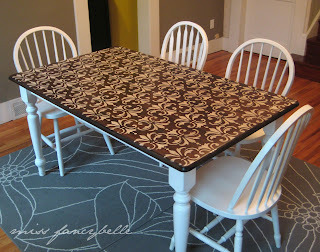 I thought a patterned tabletop would help disguise any kid-related snafus, maybe! 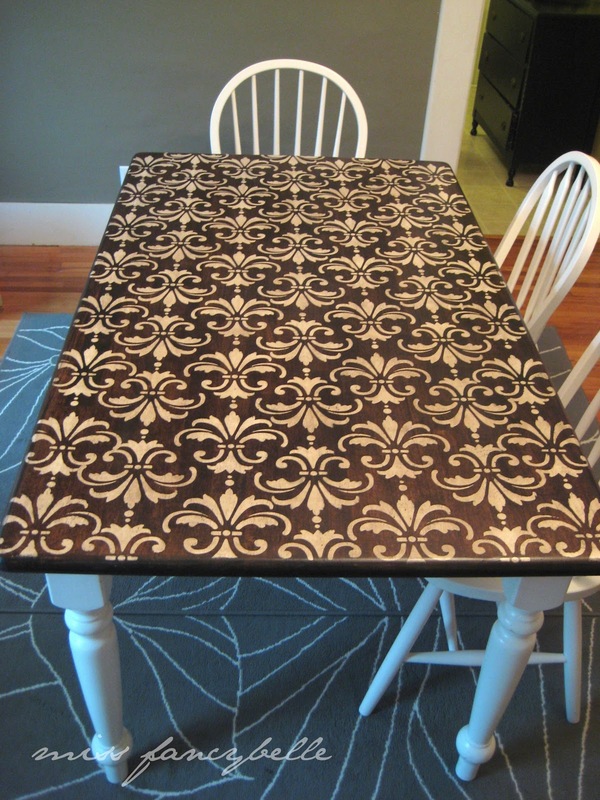 The new table concept would involve sanding down our tabletop, painting a stencil across it, applying a darker wood stain, then sealing the whole thing with polycrylic. Lucky me, I already had a really cute $4 fleur-de-lis style stencil on hand from my curtain project! 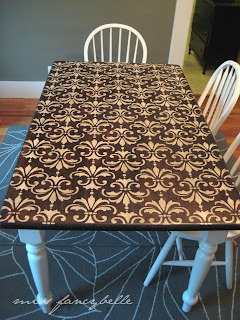 I just didn't want to spend $50 on a large-scale stencil...but it took many hours of stenciling a repeating pattern in exchange, way into the late night hours! I started in the middle and worked my way out. I love how it turned out! My husband used his orbital sander to remove the old blonde finish...thanks dear! Then I applied three coats of Minwax Wood Finish in Dark Walnut. I also sanded with our orbital sander in-between each coat. 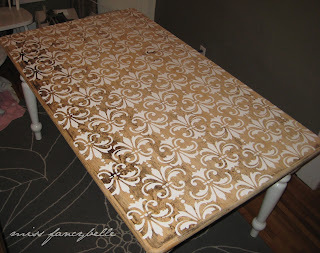 This was my first time working with wood stains, and whew...what a smell! I'm not a fan. The final step was applying a polycrylic sealant, also a first for me. I'll definitely use it again on all my painting projects! It really leaves such a nice, professional (and durable) finish. I did three coats, lightly sanding with a fine grit sanding block in-between coats. 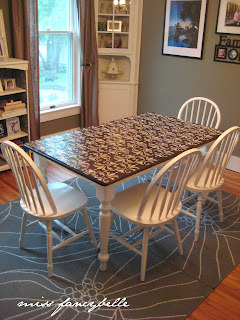 I'm so in love with our "new" table!! We actually served dinner on it last night and it was such a cool experience! 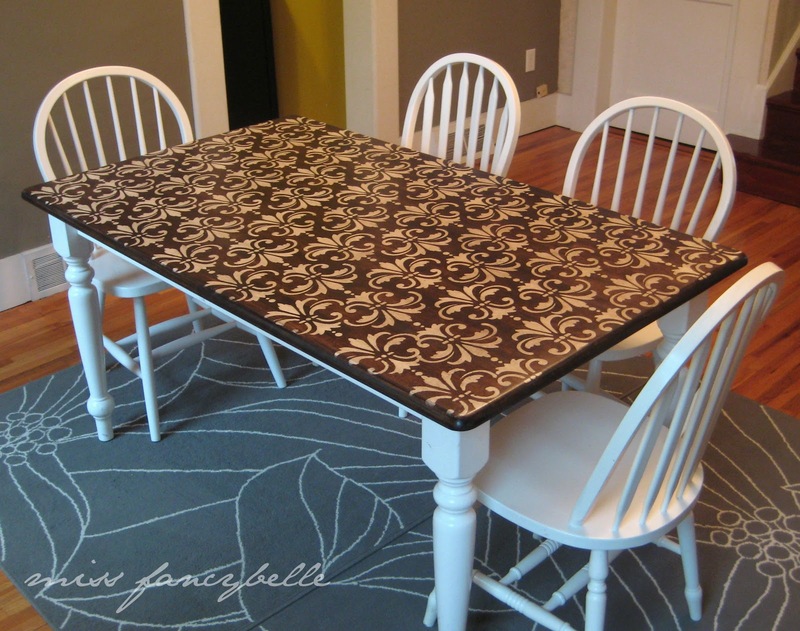 After using our rickety extra drop-leaf table for the past several days, we felt like we were in some kind of fancy restaurant...ha ha! And I'm so happy with our all-white chairs. They even seem easier to clean now, thanks to a final coat of polycrylic. Thank you so much to Ashley from Domestic Imperfection for inspiring me to do this table makeover and providing great guidance! I have a few other furniture DIY projects to share in the upcoming weeks, including our decoupaged bookcase that is something I just love. :) Thanks for stopping by!! I just think the sleeves on this garment are adorable!! 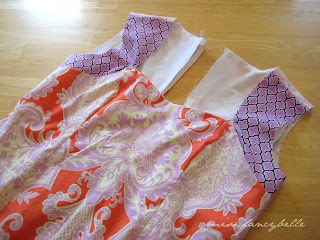 By the last day of our Sew-a-Long, all I still needed to do was hem my garment. However, I inadvertently made my muslin lining just a touch smaller than the outer shell. Ooops! So I had to open and fix one seam, then I was able to hem it just fine. It went really quickly, thankfully! Just a few notes about this pattern, in the vein of a review: the Lotus Tunic is a very easy pattern to follow. This is the third Amy Butler pattern I've used so far and I've been happy with the results every time! As with any garment you're working on, definitely try it on midway and adjust for fit issues. My hubby is a good helper with this. He does computerized drafting all day long, so measurements come naturally to him! I ended up making my seams around the bust/shoulder area smaller than the pattern called for (about 5/8" as opposed to 1/2") and a smidge bigger than 1/2" from the hips down. What can I say...I'm kinda a giant rectangle!! 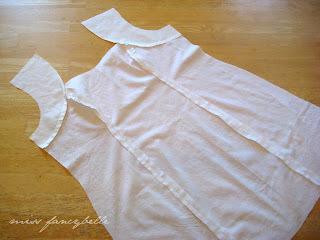 Also, if you decide to shorten the tunic like I did, you might need to trim off more than 5 inches. I'm nearly six feet tall, so 5" wouldn't be nearly enough for you petite ladies. :) And I'd advised shortening it if you are of average or petite height. The tunic was absolutely more of a dress on my friend Cara, my Sew-a-Long partner. 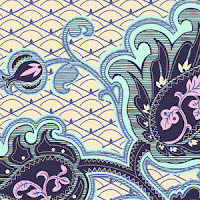 In any case, please note that this pattern calls for more fabric than necessary, especially if you're going to shorten it. 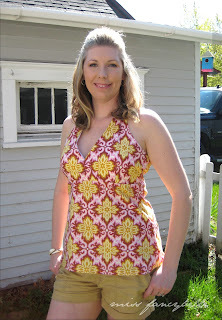 This shortened garment is a size Large, and I used 1 1/2 yards of main fabric and maybe a little more than a fat quarter's worth of fabric for the coordinating pieces. 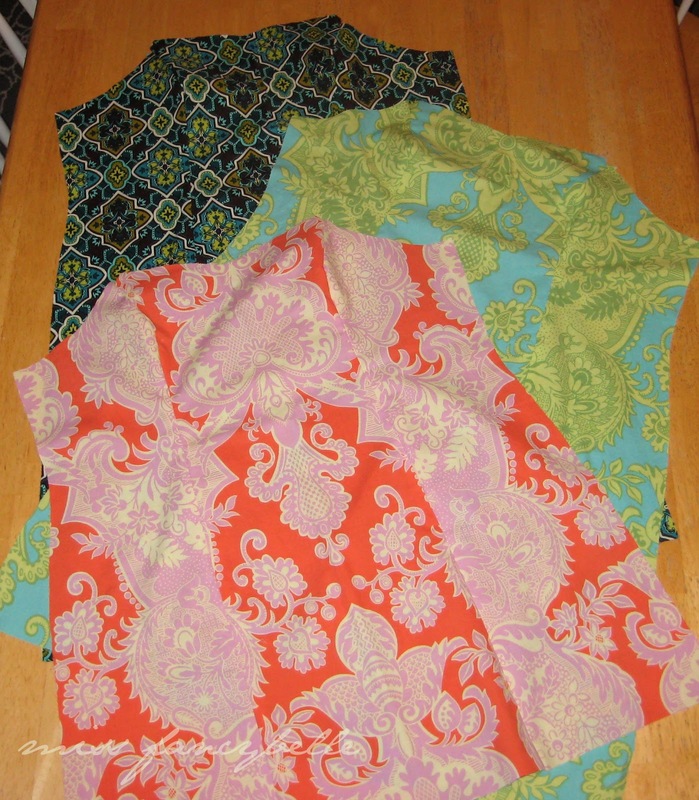 For the full tunics I'm making for my sister and my second top, I used 2 yards of main fabric. Finally...about the lining: I can see making this top piece by piece with the lining already sewn to the pattern pieces. 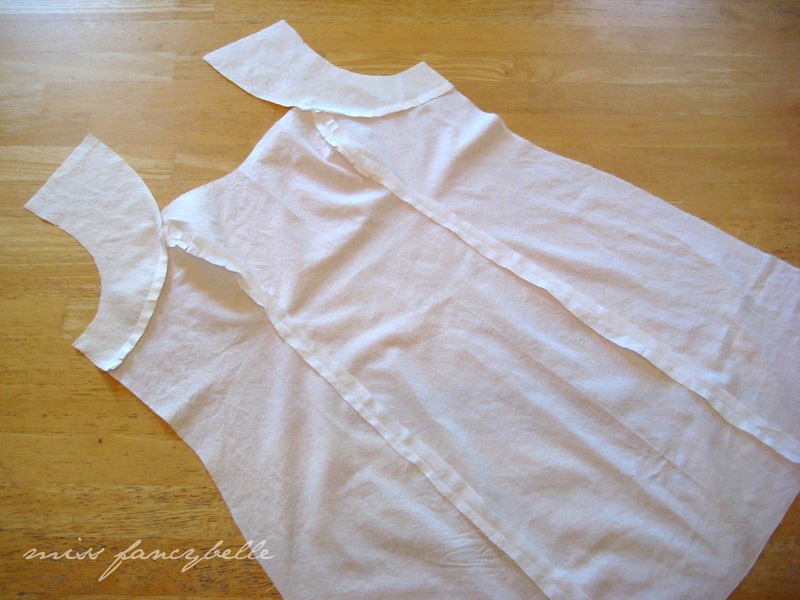 Muslin is so light and pliable, I don't think it would add any discernible bulkiness to the seams that way. Maybe, but I don't know. 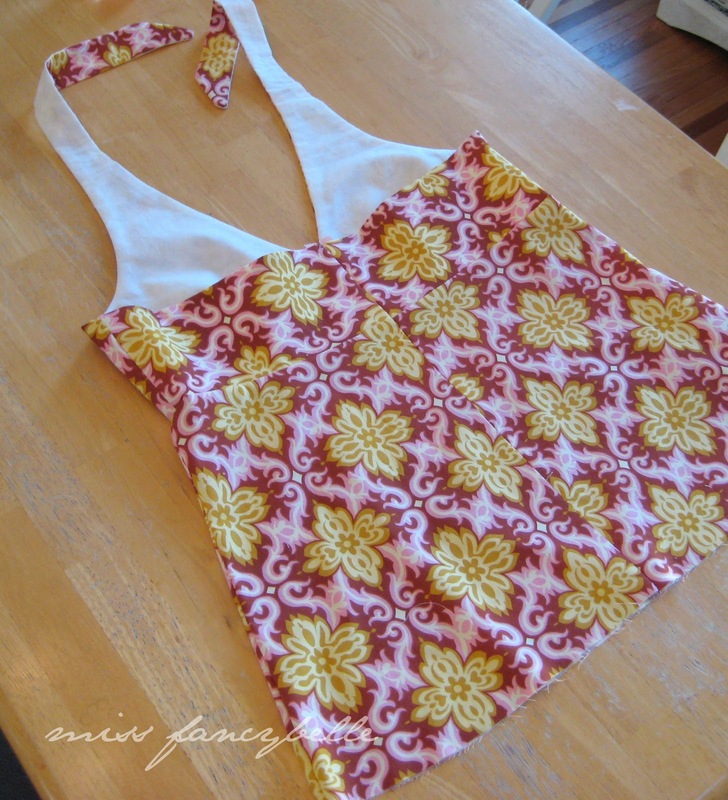 Any more experienced seamstresses want to weight in on this? I better run! Next up I'll be posting pics and a pattern review of the Amy Butler Blue Sky Sun Hat! I made two, one for my Grandma's Mother's Day gift and then one for myself. 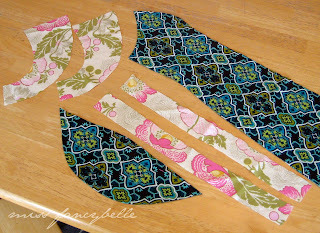 :) And, of course, I'll soon be finishing and posting pics of the other two Lotus Tunics I have in the works. Can't wait! Day 3: Well, things certainly started to slow down for me mid-week. On Day 3, all I managed to do was install zippers on all 3 garments and then wrangle my muslin linings. Sounds easy, right? Not if you have a certain 11 months old that wants to participate! "Is this my new blanket, Momma?" Hey, come back with that muslin!!! This section of the pattern calls for finishing or serging all the seams, but I boldly chose to skip that step after consulting with my mother. All the seams will be encased in the interior of the garment after it's complete, so I didn't really see an acute need for all that extra reinforcement. Plus, I was running short on time! 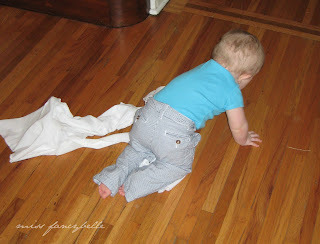 Actually, the muslin came together really quickly but I only had an hour or two to put into it all. There was some wonkiness at the outer corners of neckline that required a little extra clipping and stitching, but otherwise I was super pleased with the results! It was my first time understitching anything so I had to google it to figure out exactly what to do. Easy peasy, though! Here's the video I used to figure it out. Then it was sleeve time! The pattern calls for gathering stitches or basting at 1/2" and 3/8" on the sleeve piece, but next time I'll stitch at 1/4" and 3/8" to avoid having to clip those seams out later. I also made the circumference of my sleeve just a little bit bigger than the pattern called for. The size Large top has a 9 1/2" sleeve, but mine ended up at 11". I was worried it might look too poofy, but I'm happy with the end results. Plenty of room to move my arms around! Isn't it so cute and feminine? Another first for me...I used Amy Butler's method of attaching bias tape instead of my quick, one step (and maybe incorrect!) method! 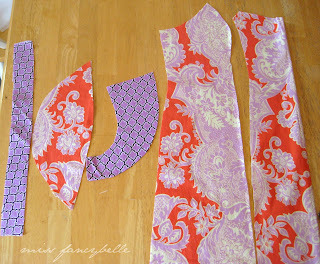 Here's a tutorial on sewing bias tape on a curve that really has great step-by-step pics: Bias Tape Tutorial. Pretty cool, really! I'm a convert!! Mother's Day weekend is upon us, so I'll have to post my Day 5 finale and pics after the weekend. 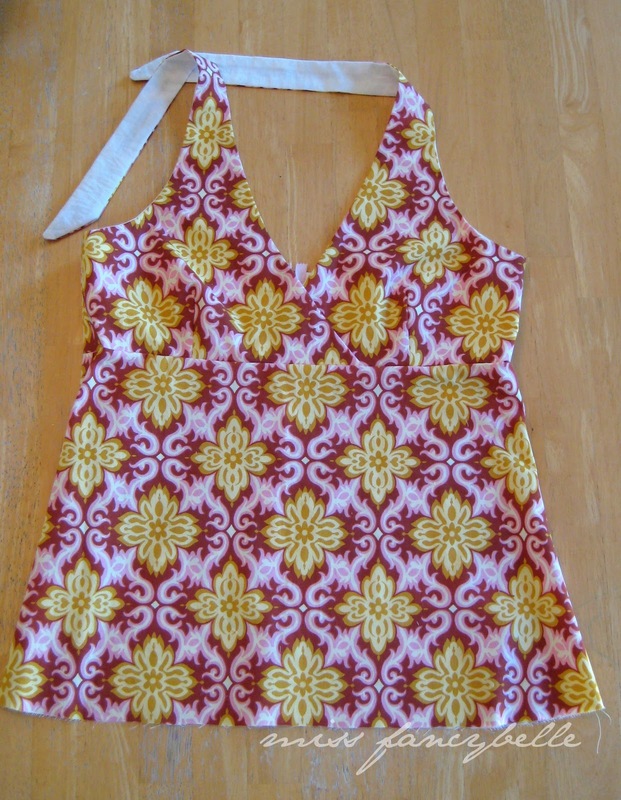 So excited to share photos of my finished garment with you! Yes, I actually finished it...ha! So adorable and worth all the work...plus, the fit is just perfect for me. :) Can't wait to wear it on Mother's Day! 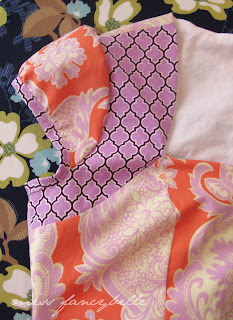 Thanks so much for visiting my blog and Sew-a-Long! Hey there! 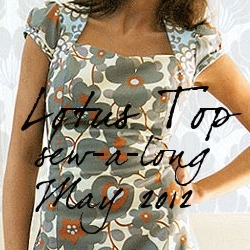 It's our Amy Butler Lotus Tunic Sew-a-long week and now we're getting into some real work here! Monday we traced and cut our fabric pattern pieces and Day 2 was the start of sewing them together, which is always exciting! 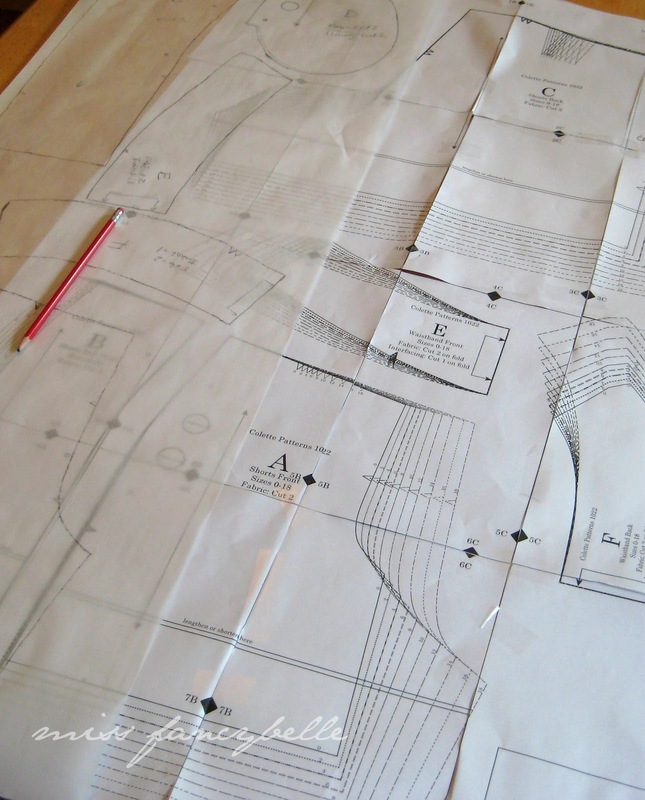 I love seeing the garment come together! Remember, I decided to sew 2 tops for myself and then I added a third top per the request of my sister. I'm a nice sister, right? Ha ha! Actually, I'm not sure if I'll finish hers this week, but it's good to get a head start! 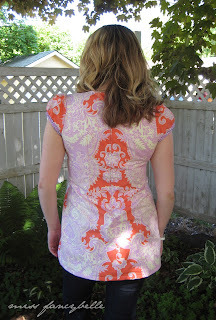 I just love the sweetheart neckline on these tops! I've never sewn a garment like that and I'm definitely happy with the look. 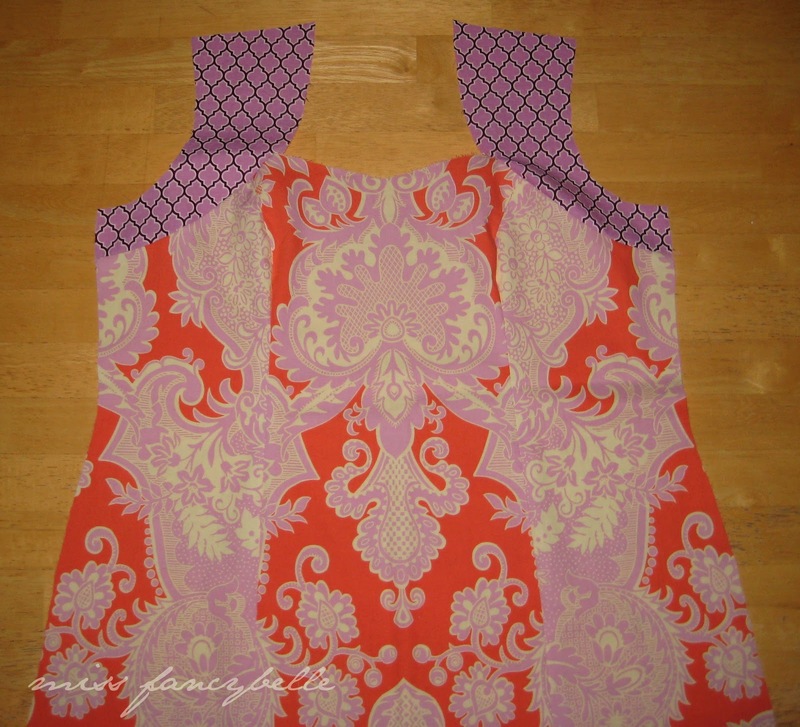 Then I attached the upper bodice pieces. Easing around this curve wasn't so much fun, but I was getting more efficient by my third top! Still, check out how many pins I needed! 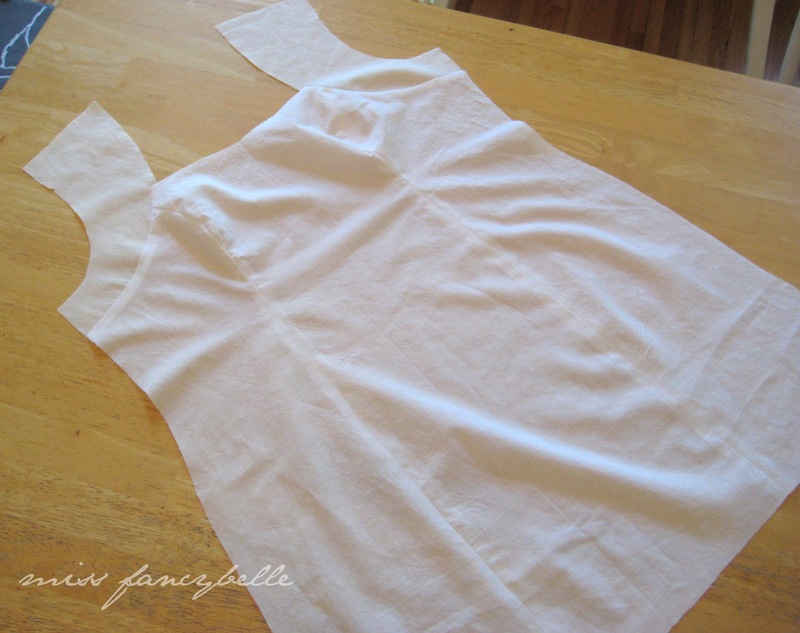 At this point, I'm all the way through Step 10 (minus inserting zippers) and ready to start sewing my muslin linings. I'm actually not too thrilled with the color combo on my sister's green/aqua Sandlewood top. I hate to change it now, but I plan on getting her opinion ASAP and proceed accordingly! Just a quick note...be sure to try on your top at this point and see if any fit adjustments are needed. I tried on my sister's top first and decided to use a smaller seam allowance on my two tops where the shoulder attaches. I happen to be quite tall (5'11") and I could use a tiny bit more length in that area compared to her smaller stature. Otherwise, I was very happy with the fit and really looking forward to wearing these tops eventually!! Next up...two more days of sewing, and then Friday to finish up! Check out our Flickr group for more pics and also please visit my friend Cara's site, My Little Lady Designs, to read all about her progress with the Lotus Sew-a-Long! Today's the big day! 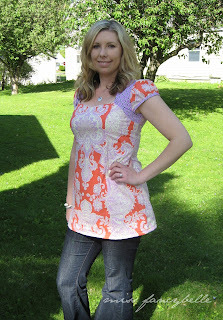 For those of you who are just joining us, we are starting a sew-a-long for the beautiful Amy Butler Lotus Tunic Top. 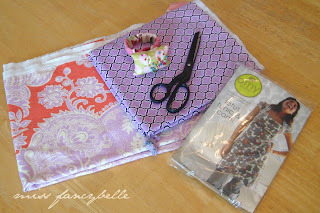 Check out or join or Flickr group for even more pics and you can follow along with our progress on this blog or my sew-a-long partner's blog: My Little Lady Designs! By the way, I've decided to cut two tops and sew them both this week. Wish me luck! Actually, my sister saw how cute this pattern is and immediately wanted me to make a top for her too, so I might add a third to the mix if I can squeeze out enough time! I'm pretty busy as a stay-at-home mom with three kids aged 4 and under, so I'm not super optimistic about finishing it all! 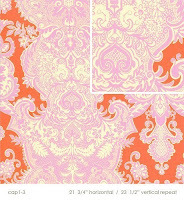 A few notes about this pattern...the pieces are in tissue like a traditional McCall's or Simplicity pattern. I'm not a fan of that. 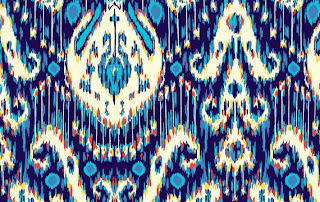 Since I've been exposed to digital patterns on paper, I just prefer their sturdiness. Oh well! 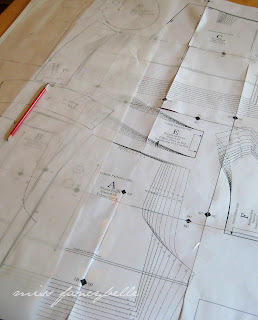 I also like to use parchment paper to trace my pattern pieces, when/if they'll fit. Then I can re-use them and not worry about tearing or excessive crinkling. 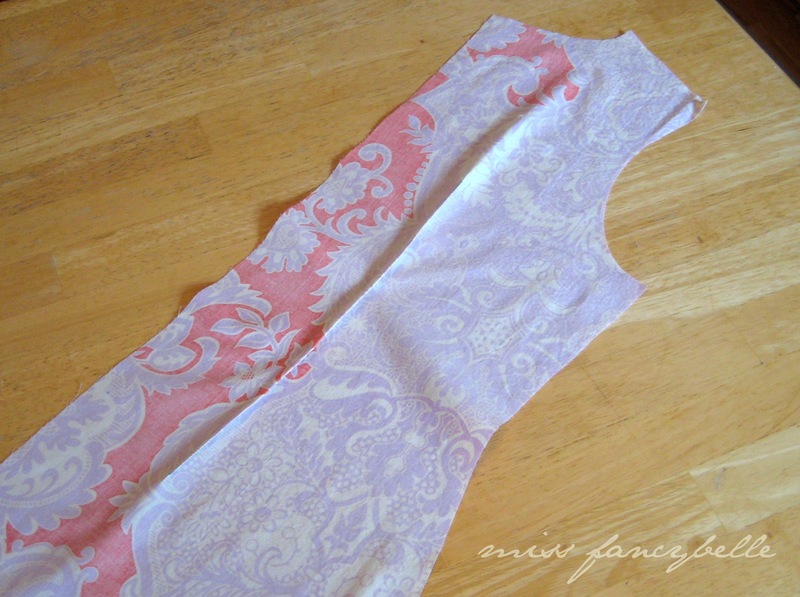 Since I didn't have a full 2 yards of this fabric on hand, I decided to make a hip-length version of the Lotus Tunic. Thus, I trimmed 5 inches from the bottom of each body pattern piece. The other option for a shorted top was to use the Cami pattern, but I wasn't as happy with how the fit looked on example pieces I've seen or having buttons up the back. 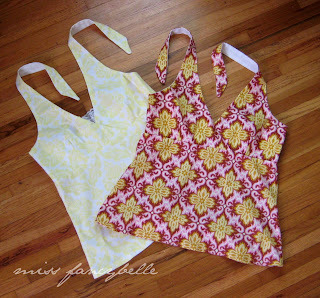 Anyone interested in sewing another Amy Butler pattern with me? Actually, my friend Cara from My Little Lady Designs and I will be sewing the Lotus Tunic Top week with our own sew-a-long!! Cara and I were college roommates and even though we live in different states, we are having so much fun sewing "together"! 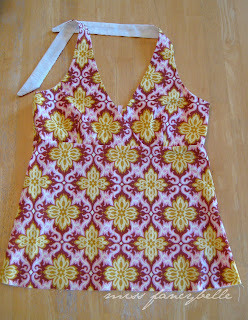 :) It's not often that I sew just for myself, but I'm on a roll and loving it! I even made my first Flickr group so we can share our photos: http://www.flickr.com/groups/lotuspattern/! It's no secret that I love Amy Butler. I guess it was only a matter of time until each of the rooms in my house had some kind of Amy Butler fabric in them! 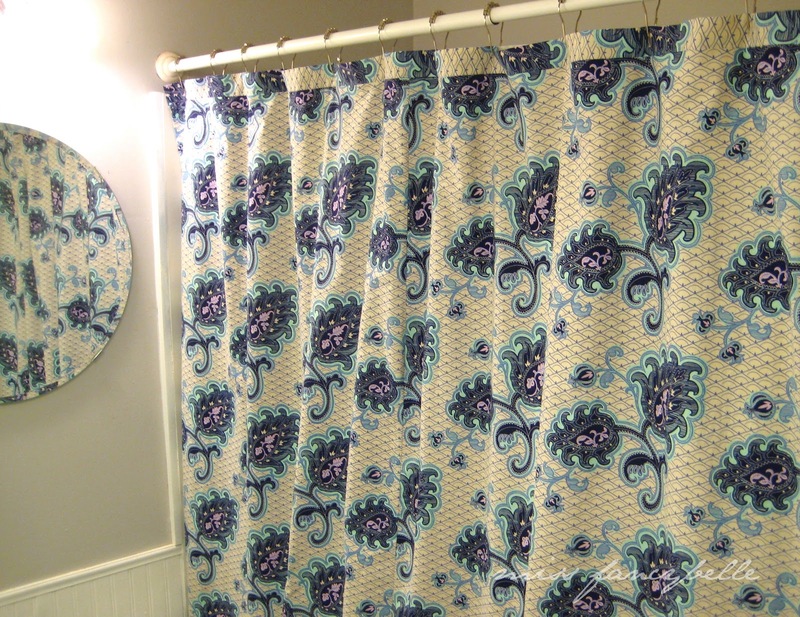 A shower curtain seems like such an easy project, right? Well, stick with me and I'll give you some practical tips to help you sew a new shower curtain of your own. A little less than a year ago, I picked out her Arabesque in Ivory for a nursing cover that a friend made and left it hanging in the bathroom. A shot of the curtain top, with a grand total of TWELVE buttonholes! 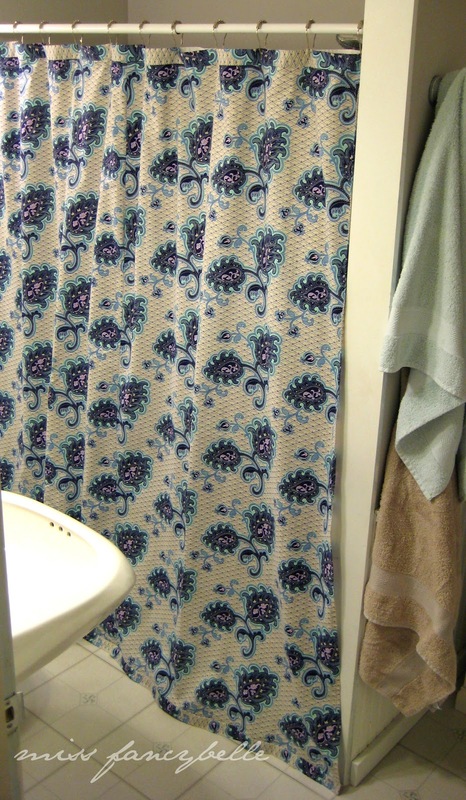 The finished size of this curtain is about 73"x73", just a tad larger than a standard shower curtain measurement of 72" x 72". 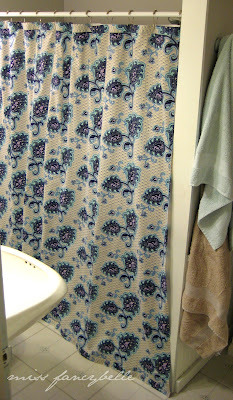 To make this curtain, I purchased 4 yards of fabric cut into 2 yard sections. Then I put the two 2-yard pieces right sides together and peeked between them to see if the fabric designs lined up, which they didn't. Sigh! 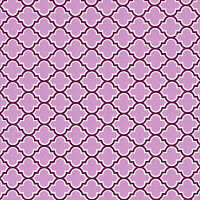 I had to pin and then check the alignment...pin and check...pin and check...until I was fairly pleased with the pattern match-up. Obviously, this wouldn't be an issue if you used a solid colored fabric. Once I had my sections pinned together properly, I trimmed off the excess fabric leaving about one inch of a seam allowance. You could easily do less of a seam allowance, but I get nervous and like to leave myself with plenty of room! 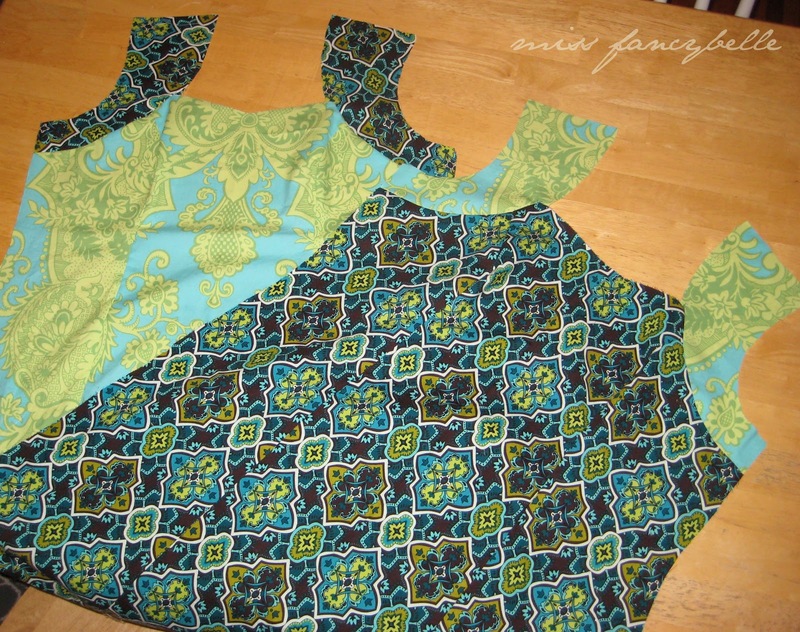 Then I sewed the two pieces together using a french seam because I don't have a serger. Here's an easy tutorial if you want to try out a french seam: How To Create a French Seam. You could also finish your raw edges with a zigzag stitch or serge it, then press your seams open. After that, I took my excess pieces of fabric that I cut from the seam area earlier and decided to use them as edging around the top and bottom areas of the curtain. I cut each piece to the same width as the finished curtain and then folded each piece horizontally, right sides together. Since the plan was to sew buttonholes along the top for the shower curtain hooks to go through, I figured it would be best to use a double thickness of fabric for that area. 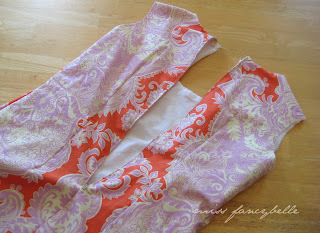 I'd suggest adding light interfacing inside the edging/buttonhole area too, if you are so inclined. 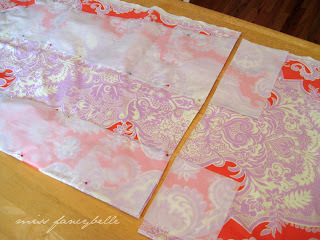 The next step was to sew my edging pieces to the main body of the curtain. I lined up each piece right sides together, raw edges together, and sewed it with a 1/2" seam allowance. I finished my raw edges by trimming them with a pinking shears and then sewing over the edges with a small zigzag stitch. 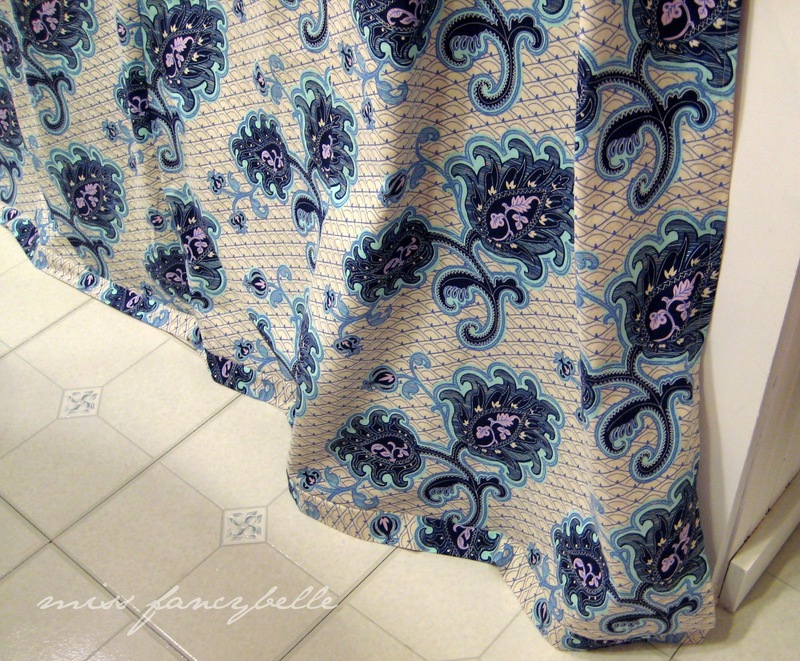 The final step was to hem the sides of the curtain. 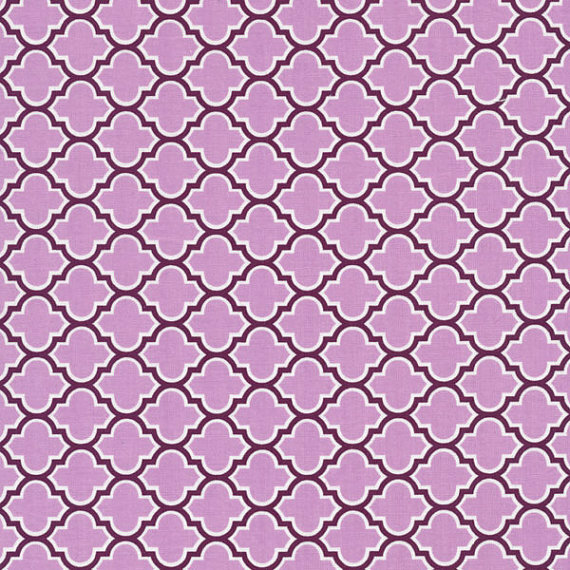 For this, I pressed the edges under twice and then top-stitched. 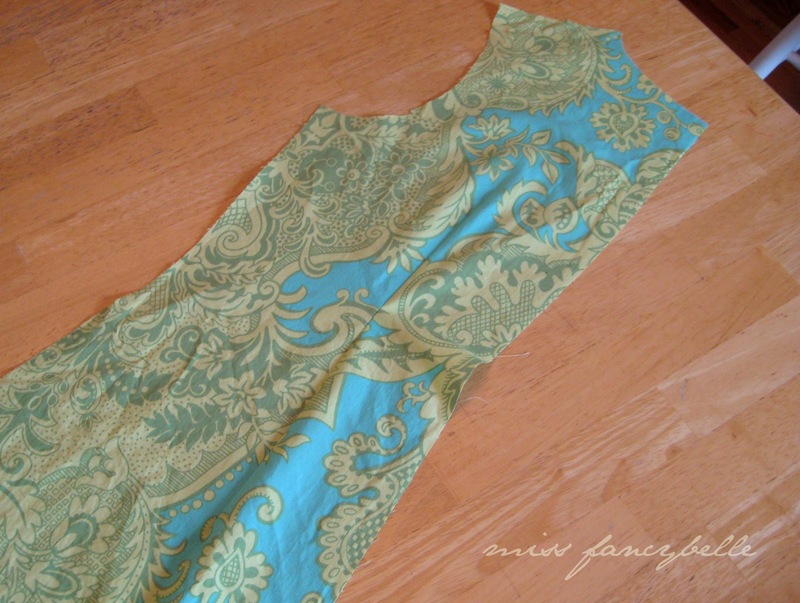 Here's more info on how to sew a basic hem: Sew a Simple Hem. Since I had twelve curtain hooks, I needed to sew twelve evenly dispersed buttonholes on the top edging of my nearly finished shower curtain. For this, I used my old curtain as a guide for where to place the holes, and then marked the placement with a chalk pencil. Some of the first buttonholes I ever made are on this curtain, and it was shockingly easy!! (If you can guess...I did a few test buttonholes on scrap fabric just to get my bearings! My Singer came with an automatic buttonhole foot, but very skimpy directions on how to use it. 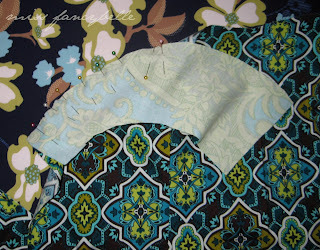 Here is the video tutorial I found that really helped me with my automatic buttonhole foot: Sew a Buttonhole. I also suggest reading this excellent article on sewing buttonholes from Sew for Home if you're also new to sewing buttonholes. 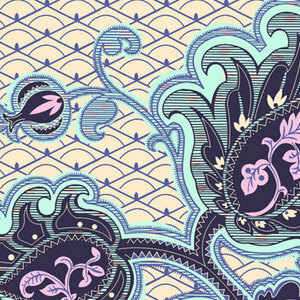 Here's a sneak preview of two new projects I currently have on deck! First, Iris Shorts from Colette Patterns. So far, I just have my paper pattern pieces cut out. This will be my first time using Colette Patterns, and I'm hoping to write a review once I'm all done! 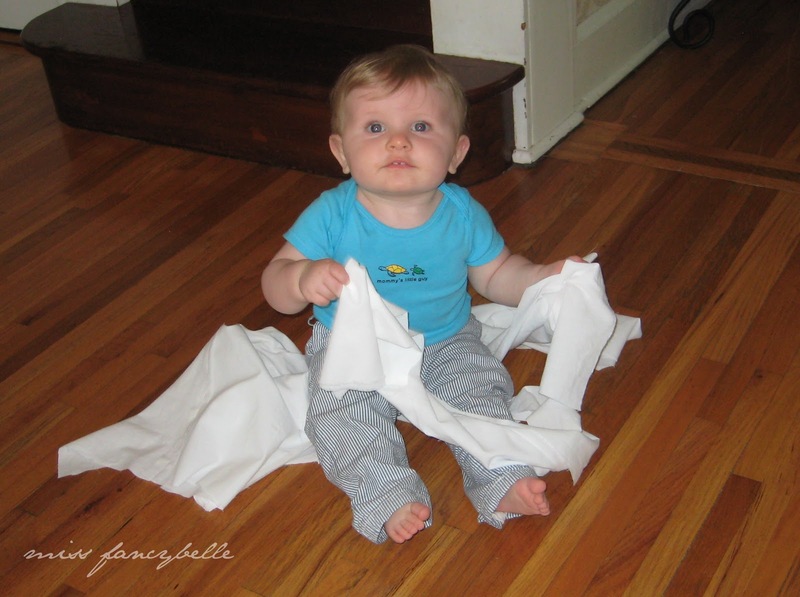 Now, if I could only settle on a good fabric to use! 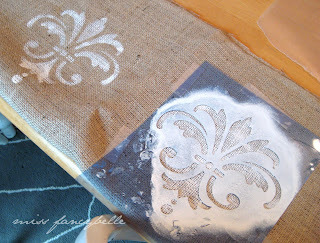 Yep, that's me stenciling with fabric paint onto burlap! Eventually these hunks of burlap will be accent edges on our living room curtains. Can't wait!! Have a fabulous week!!! Here are some pics of my progress from Day 3! All is done except the hem on my Temple Garland piece!!! Most of Day 3 involved sewing the body pieces and attaching the zipper. 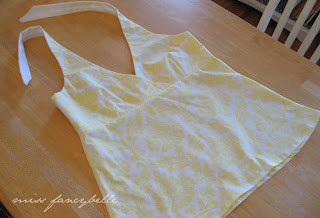 I had to rip and re-sew my seams a few times on the yellow shirt I completed first. I just couldn't get the side seams to match up exactly the first time around! I had the fabric pieces pinned okay, but I guess I nudged it out of line somehow while sewing. Oh well, I compensated accordingly on the Temple Garland halter and no problems arose. There are tons of tutorials and videos online about sewing zippers, but I use a method I learned from the Sew Mama Sew blog. Click HERE for her tutorial. It's basically in line with what my mom told me, but fuses the zipper directly to the garment before sewing, eliminating pins and any wonkiness. I love it! !